I don’t do a lot of endorsements for other people’s products here, but one I must mention is Jimmy Brown. Recently I purchased his “Small Reports Fortune” and “SALES Army Secrets” along with a few of his other offers. His products are excellent. They’re packed with content and specific action steps to take immediately to build your online business. And what’s most interesting is his sales model. 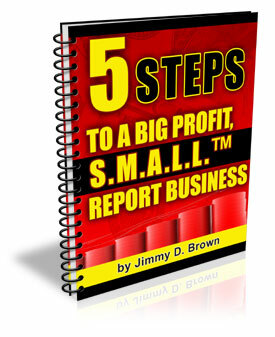 He follows the lesson of give first to prove your worth by providing free downloadable reports on each of his products.